This month for Kin women I have been working on the theme womanhood through a photo series called ‘she is…’.We have so many names, titles, expectations and adjectives that society places upon our lives. But really who are we? She is fat. She is a gossip. She is a b**ch. She is outrageous. She is too much. She is shy. Lately I have been contemplating on who I really am. Who am I? Without any titles, without any accolades, without anything to distract me from the true essence of my womanhood. who defines who I am?, who I allow to speak words over my life? and I have been drawn back in the midst of this contemplation to a chapter of the Bible, that focuses solely on womankind. How could I be all that? There are many parts of the proverb that have been really affecting and impacting my everyday. I am drawn back to the grounded-ness of the woman I am reading and reflecting upon, rather than a superhero princess-ified warrior chick. I am reading between the lines a common house wife, a partner, a mother, a hard-worker, a gardener, a crocheter, a designer, a chef. I long to be more grounded like the woman I see described, getting about and making a difference in my families everyday, living a life that adds up behind closed doors. Making a difference in my part of the garden. I don’t know about you, but the longer I have waited, the harder I have worked, the more tears I have shed, the sweeter the victory. 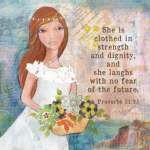 Proverbs 31 is so much more than a princess-ified, waiting in the castle, warrior chick. She is a hard working, multitasking, woman of integrity and strength. A lot more like a farmers wife to me. I am not sure that Disney would want to make a common housewife its latest cult status heroine however? But she is a hero to me. Thanks so much for your encouragement. I am grateful for your voice through writing also.